The origin of the Hitlerjugend, or "Hitler Youth", dated back to 19 Mar 1922 when the Jungsturm Adolf Hitler program was established in Munich, Bavaria, Germany one year after the start of the Sturmabteilung (SA) para-military organization as a training program for the SA. Between the failed Beer Hall Putsch in 1923, the Jungsturm Adolf Hitler went underground and operated in small cells; the combined membership of these smaller organizations were estimated at 5,000 by 1925. In early 1926, Kurt Gruber merged several of the remnant cells to form the Großdeutsche Jugendbewegung, or "Greater German Youth Movement", while around the same time Gerhard Roßbach operated the Schilljugend based out of Southern Germany and Salzburg, Austria; there were also many other politically-motivated youth organizations in Germany at the time. On 4 Jul 1926, National Party Day, only six months after the establishment of the Greater German Youth Movement, it became the official youth organization of the Nazi Party. In the following month, it took on its new name that identified itself as an official instrument of the Nazi Party: Hitlerjugend. By 1930, the Hitler Youth had a membership of 25,000 boys older than 14 years of age. It also expanded its operations by establishing the Deutsches Jungvolk for boys aged 10 to 14. In 1928, the Hitler Youth organized Schwesternschaft der Hitlerjugend for girls; in 1930, it was renamed the Bund Deutscher Mädel, or League of German Girls. In Apr 1932, the Hitler Youth movement was banned by Chancellor Heinrich Brüning because it was so politically motivated, but the ban was lifted two months later by Brüning's successor, Franz von Papen, in an attempt to appease Adolf Hitler, who was undeniably becoming more and more influential in German politics. By the end of 1932, a few weeks before the Nazi Party came into power in Germany, the membership was at 107,956. In 1933, Baldur von Schirach became the first Reichsjugendführer, or the Reich Youth Leader, of the Hitler Youth. By the end of 1933, growing popularity and forced merger of various youth organizations grew the membership to over 2,000,000. In early Dec 1936, membership grew to over 5,000,000 as it comprised of over 60% of German youth. Later in the same month, membership became compulsory for all German boys between 14 and 18. As expected, the boys of the Hitler Youth spent much of the time performing physical training via sports and hiking, preparing them for military service. Hiking often became training for military marches, while activities around the camp fire included basic weapons training. Stories told in the evenings were full of Nazi ideals, including anti-Semitic indoctrination. Bullies among the group who preyed on younger boys were tolerated, or even in many instances, encouraged, since it was believed that it would harden the younger boys, allowing them to become stronger and be able to stand up for themselves. 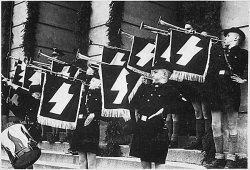 Those most promising and loyal boys in the organization became candidates to join the Schutzstaffel (SS), while others identified with leadership abilities were sent to special academies run by the Hitler Youth to train future military officers. The League of German Girls became more so in the mainstream in 1933 when the Nazi Party came into power. In 1934, Trude Mohr was placed in charge of the league, hence allowing the group more autonomy from Schirach's top management. In 1937, Mohr became married thus became ineligible for the position. Mohr succeeded by Dr. Jutta Rüdiger, a doctor of Psychology, who remained its head until 1945. The league focused on the grooming of girls and young women to become proper women of the Nazi society, though education and training aspects of the program was also significant. The girls actually received a greater variety of education than the boys, since the boys were trained largely only in the fields useful for military service. In 1938, a voluntary branch called Glaube und Schönheit, or Belief and Beauty, was established to specifically prepare women between the age of 17 and 21 for raising families. By 1939, all ethnic German girls were required to join. Before the establishment of the League of German Girls, few girls traveled without their families, and activities such as hiking and camping were frowned upon by the conservative society. The league gave girls and young women exposure to more things than ever before, thus it was very popular, and the Nazi Party in turn used it successfully as a tool of indoctrination. In 1940, Arthur Axmann took over the responsibility of running the Hitler Youth, which by this time had 90% of German youth in its membership. As the European War had already begun, Axmann focused on reforming the 8,000,000-strong organization so that the children could directly aid war efforts. Early in the war, boys served in postal and firefighting roles, but as the war went on many of them took on more demanding roles such as being members of anti-aircraft gun crews. In 1941, Axmann authorized the policy requiring all German boys over the age of 10 to join the Hitler Youth. As Allied bombing of German cities became more frequent, many boys and girls also became critical elements in the efforts to deliver food and supplies to the displaced. By 1943, the Hitler Youth took on a direct role as a military reserve force with the establishment of the 12 SS Panzer Division Hitlerjugend under the command of SS-Brigadeführer Fritz Witt and later SS-Standartenführer Kurt Meyer. The unit was a fully equipped Waffen-SS armored division with adult officers and enlisted men between 16 and 18 years of age. This division was stationed in Normandy, France in mid-1944 and encountered Allied troops; American, British, and Canadian soldiers recalled their ferocity and unquestioning loyalty to Nazi Germany, making these boys some of the toughest opponents the Allied soldiers had faced. 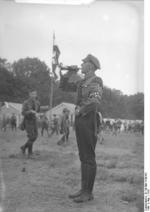 As the war went on, boys as young as 10 were placed into the Hitler Youth, and by 1945, it was common to see 12-year-old boys serving in Volkssturm units. When Berlin was surrounded by Russian forces, a significant part of the defense of Berlin was conducted by Volkssturm units with sizeable Hitler Youth members. The girls of the Hitler Youth, or specifically of the League of German Girls, did not serve as directly as the boys at first. They collected donations, gathered old clothing, collected scrap metal, prepared care packages to the soldiers in the front lines, and alongside of boys helped to distribute food and water to those displaced by Allied bombing. As war demands increased, however, their contributions to the war effort also took on a more direct role. Many of the older girls were transferred into Red Cross nurse training programs, learning hands on at aid stations treating civilians wounded by Allied bombing. By late-1943, many of them received military training and were transferred to the Luftwaffe, the German air force, and served as Flak Helpers or searchlight operators. An unknown number of girls served in Volkssturm units in the final days of the war, although this was not officially ordered by Rüdiger or the senior leaders at the Hitler Youth. After the war, the Allied occupation forces disbanded the Hitler Youth. Most young leaders of the group were not charged with war crimes, even if there were evidence, as they were children. Despite membership being compulsory, thus nearly all children of the period were Hitler Youth members, many prominent post-war leaders were still scrutinized over their membership. For example, the media placed Pope Benedict XVI in the center of attention for his membership in the Hitler Youth between 1941 and 1943. Um... not agreed. I like the way this information looks, and I don't see how Wikipedia as a source ruins anything. wikipedia is a site where any random person can go on and add information. I agree that to use wikipedia as a source is not very subjective. maternity was the main teachings of the leage of german girls, thats sad. I am writing a book about my mother in the Jungmaedel, in Landjahr and in the BDM. I have actual diaries which goes into explicit detil about her life during these years. In addition, she shared her stories with me growing up as a child. Wikipedia gets most of the information correct. However, my book is directly from the source, with interviews of other woman who experienced this time in their lives. They were brought up to have the highest moral character standards. They were not 'just raised' for breeding. Get YOUR facts straight. Wikipedia does not allow "randoms" to post and or alter information. You must have an account and you cannot alter or post information on most pages because they are very popular. Just because you have the option to edit information , it does not mean it is unreliable. I am using this information for a school project and need to know why Hitler created the Hitler Youth, and how it affected Germany as a country. I'm using this for a project. It seems reliable enough to me. Nothing sounds stupid. Plus, I read the comments and its gotta be pretty accurate according to what you guys said. this website is okay but its from wikipedia!!!!!!!!!!!!!!!!!!!!!! I plan to write a book about members of the Hitler Youth groups prior to, during and following WWII. I need to find these people for in-person interviews where feasible and/or letters or email responses. My focus will be on whether they joined voluntarily or were compelled; did the Nazi values and teachings differ from those of their parents; were they involved in the U.S. Armed Forces Youth Activities Program from 1945-1955 and how did their experiences affect their adult lives. I will honor all those who choose to remain anonymous. Thanks for any and all referrals. did the youth camps have numbers. My brother-in-law had a 5 on the back of his left hand. Trying to identify why the number 5? Hitler used the Hitler Youth Movement to brainwash young minds and were the major reason he achieved power. 96% of adults were against him in early years. He also used it to sever children's relationship with family by keeping them busy every weekend and evening. It started slow at first and slowly accelerated. Then Stalin, Mao (Red Guard), N. Korea, imitated him with great success. Especially teens are vulnerable to this kind of propaganda. They did use a great deal of violence from very early age. My ex's German mother created a family cult with her at the apex. They even use military style brainwashing on infants. I witnessed it. And they retain control throughout life. I witnessed it in action on her 26 year old sister. Very creepy and effective. Was Mölln one of the locations where Hitler youth were trained? I'm trying to find information about this, but can't seem to find any. My biological father (Friedrick Erwin Kollischan) was one of Hitler's youth soldiers. Did they keep records of the youth? I'm working on my family tree. Not happy to find a Hitler youth photo from 1937 in a box in a shed in Connecticut, USA and want to turn it in for historical record. It has a postmark on the back and is signed Horst.